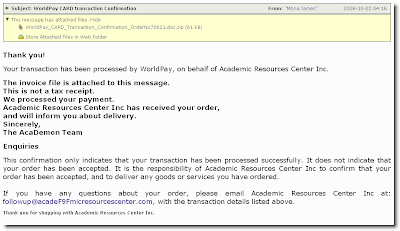 Your transaction has been processed by WorldPay, on behalf of Academic Resources Center Inc. This confirmation only indicates that your transaction has been processed successfully. It does not indicate that your order has been accepted. It is the responsibility of Academic Resources Center Inc to confirm that your order has been accepted, and to deliver any goods or services you have ordered. If you have any questions about your order, please email Academic Resources Center Inc at: followup@acadeF9Fmicresourcescenter.com, with the transaction details listed above. Thank you for shopping with Academic Resources Center Inc.